'Boring' Singapore City Photo: Singapore Fashion Festival starts next week! If you want to find out the latest fashion and design, catch the glamour festival that's coming next week to Singapore. 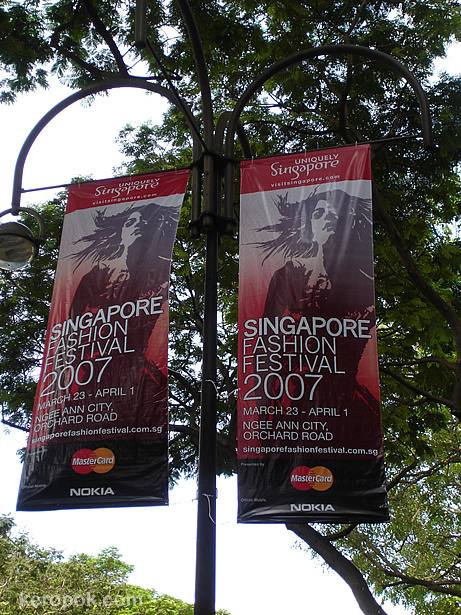 The Singapore Fashsion Festival starts in 1 week's time, on Friday 23 March till 1 April 2007. Other than catching the latest designs, you can also catch the stars who will be attending them. Banners like this are hanging along Orchard Road. The main shopping road in Singapore. It is also where the festival is going to be held. For Daily Photo bloggers visiting, Ming of NYC also had a series of the Fashion Festival in New York City. Catch his series here. Looks as it this will be a very interesting event! Nice capture of the banners! are you gona attend the festival? Thanks for the reference, Keropok Man. So where are the models?? ?